Erector 50 is a medication which, in keeping with its name is used to treat impotence and erectile dysfunction instead of Viagra. It is formulated in tablet form and all 50mg tablets contain sildenafil citrate as the main chemical ingredient. This component is vital for causing smooth muscles to relax and blood vessels to expand. In the corpus cavernosum, cGMP-specific phosphodiesterase type 5 active degrades cyclic guanosine monophosphate. This is where sildenafil citrate comes in, halting that action. When it succeeds in doing so, cGMP is able to start the processes of causing smooth muscles to relax and blood vessels in the region to relax. The latter effect makes blood flow rapidly. When blood flow is more rapid, strong erections are possible for a prolonged period of time. Erector 50 makes this happen when males are sexually excited. 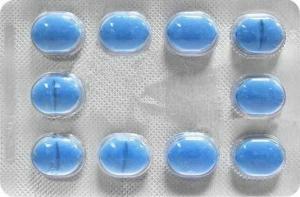 Genpharma, a pharmaceutical company headquartered in El Jadida Morocco, is responsible for the production and marketing of this sildenafil medication. Established in 2001, the company has made progress significant enough to become GMP certified with its focus on research and development in addition to its production unit at the headquarters. It is one of the market leaders in Morocco’s generic pharmaceutical industry. Beyond that Genpharma has succeeded in expanding into other countries in the Middle East and Africa. In fact, its international operations now contribute over twenty-five percent of its final sales figures. Its production efforts have resulted in a catalog including injectables, oral solid form medicines, APIs, and controlled-release medicines. As of writing, there are no reviews of Erector 50 online. We know this because we tried to get any available reviews to discuss with you in this section. We did so because many consumers rely on the availability and honesty of previous customer recollections to make a purchase decision. Although Erector 50 users have not provided that information, you should know that this sildenafil drug is just one in a portfolio of over a hundred Genpharma products in the market. They develop and market products like antibiotics, antifungal drugs, anti-inflammatory drugs, immunostimulants, diabetes medications, and erectile dysfunction medicines. Erector 50 is available in boxes of one, two, four, eight, and twelve pills. Erector also comes in 25mg and 100mg pills. We were able to ascertain the price of this medication online via the store below. A box of four tablets of Erector 50 milligrams tablets costs 87.00 Moroccan Dirham. That is roughly 9.00 US dollars. That is very affordable compared to 24.83 US dollars per pill, on the average, for Brand Viagra. A tab of Erector 50 should be used once a day. It takes a lot of effort to find Erector 50 in any online pharmacy. When we managed to locate one such store, it was unsurprising to learn that it was a Moroccan website. Trying to order the tablets in that store revealed that its services are limited to the Moroccan populace. Shipping is done locally. It is also in that store we found the pricing information above. The difficulty in finding that store also makes it apparent that the product is mainly available offline in the Middle East and Africa. Erector 50 is certainly not popular. Administer Erector 50 milligrams tablets by mouth with the aid of a glass of pure water. Do not break the tablets in your mouth as this will slow down the absorption of the drug. Absorption also slows down if Erector 50 is used leading up to or immediately following meals with high-fat content, drinks with alcohol content, or drinks made out of grape. Use one tablet a day, 30 minutes prior to sexual excitation. Sildenafil is used to care for male erectile dysfunction and should not be administered to females. Keep Erector 50 away from the reach of children. Sildenafil in the growing number of different ED drugs has been associated with a number of adverse effects. Adverse effects are rarely observed and could be either mild or severe. The milder symptoms associated with sildenafil administration include headaches, stomach upset, hives, abnormal vision, and dizziness. The more protracted ones which could be brought on by allergic reactions or overdose include Oedema of the face, lips, hands, and legs, hypotension, insomnia, and paraesthesia. See a doctor if you observe any of these. Erector is a generic sildenafil brand available in 100mg, 50mg, and 25mg tablets. It is intended to serve as a panacea for adult males who have a difficulty getting firm penile erections when aroused, as well as adult males who are unable to maintain strong erections. We just reviewed Erector 50. In the course of gathering the information you need about this product, we tried to acquire user reviews but discovered that none were available online. We noted that this medicine is only available locally in Africa and the Middle East. Lebanon, for example, provide this medicine to ED patients in the country through Genpharma’s partnership with City Pharma. City Pharma Sarl is based in Baabda, Lebanon. Genpharma is a Moroccan Pharmaceutical business with a manufacturing capacity of one hundred and twenty million boxes a year. While that is great, the lack of an online presence will only hinder any ambition the company has regarding a more robust operation. Local marketing doesn’t help either. We can give Erector 50 only one star out of five.